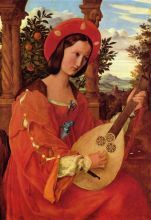 Julius Schnorr von Carolsfeld (March 26, 1794 - May 24, 1872) was a German painter. 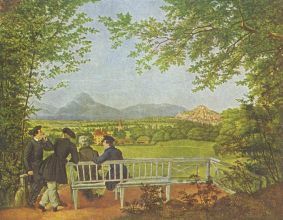 Schnorr was born at Leipzig, where he received his earliest instruction from his father Johann Veit Schnorr (1764-1841), a draughtsman, engraver and painter. 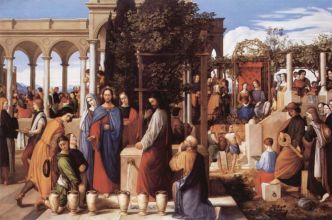 At seventeen he entered the Academy of Vienna, from which Johann Friedrich Overbeck and others who rebelled against the old conventional style had been expelled about a year before. In 1818 he followed the founders of the new artistic brotherhood, the Nazarene movement in their pilgrimage to Rome. This school of religious and romantic art abjured modern styles and reverted to and revived the principles and practice of earlier periods. 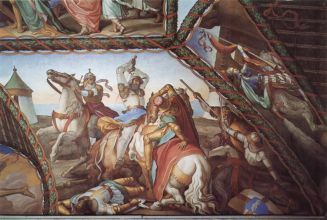 At the outset an effort was made to recover fresco painting and monumental art, and Schnorr found opportunity of proving his powers, when commissioned to decorate with frescoes, illustrative of Ariosto, the entrance hail of the Villa Massimo, near the Lateran. His fellow-laborers were Cornelius, Overbeck and Veit. 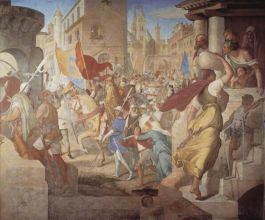 His second period dates from 1825, when he left Rome, settled in Munich, entered the service of King Ludwig, and transplanted to Germany the art of wall-painting learned in Italy. 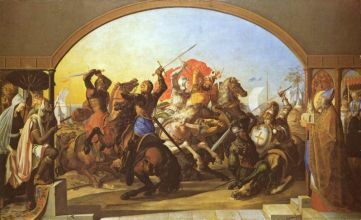 He showed himself qualified as a sort of poet-painter to the Bavarian court; he organized a staff of trained executants, and set about clothing five halls in the new palace with frescoes illustrative of the Nibelungenlied. Other apartments his prolific pencil decorated with scenes from the histories of Charlemagne, Frederick Barbarossa and Rudolph of Habsburg. These interminable compositions are creative, learned in composition, masterly in drawing, but exaggerated in thought and extravagant in style.